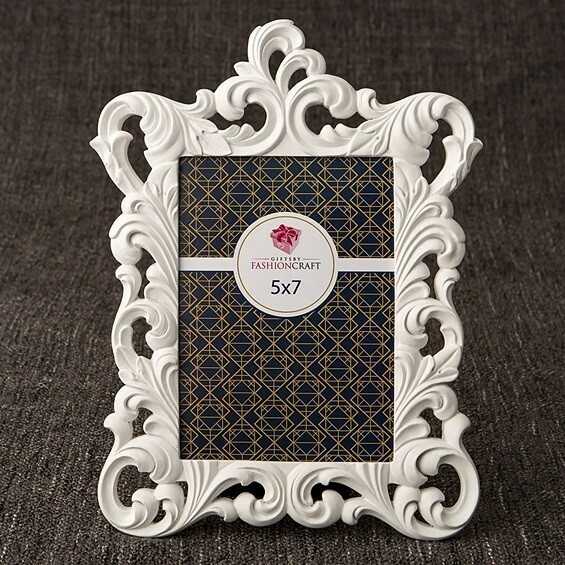 Dimensions: 11 1/2" x 8 1/4"
This opulent brushed gold frame/table number holder is made of poly-resin and features an ornate baroque design with nuumerous flourishes. The frame is painted in a pure white color to lend a crsip, classic look to your tabletops. The frame holds a standard 5" x 7" photo and features a hinged velvet backing. May be used as a table number holder or a buffet marker. Each comes packaged in a white box.